Asus on Tuesday unveiled a new range of ZenBook and VivoBook notebooks at Computex 2018 in Taipei, Taiwan. The new range includes the ZenBook Pro 14 and ZenBook Pro 15 that both feature a ScreenPad input device that appears to be inspired by the Touch Bar that featured on the MacBook Pro back in 2016. The Taiwanese company also showcased the ZenBook S, new VivoBook notebooks, and a VivoWatch BP wearable blood-pressure monitor. 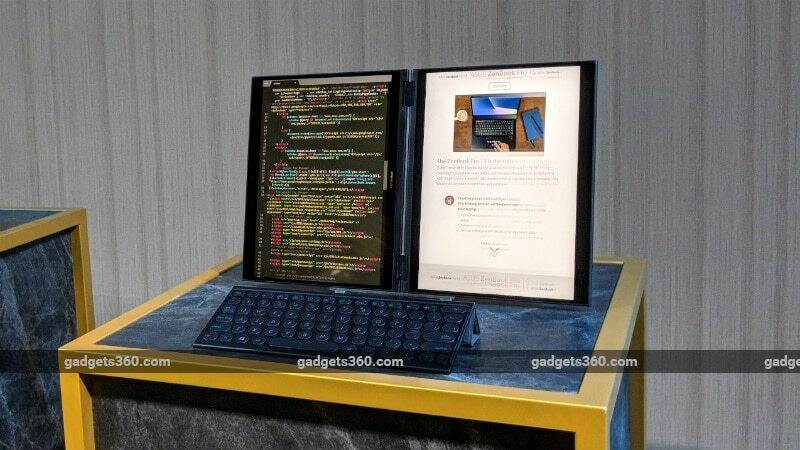 Alongside the new hardware, the company also gave a sneak peek at its Project Precog that is presently a concept device - comes as the world's first convertible dual-screen notebook equipped with artificial intelligence (AI) features. Among other models, Asus at its Computex 2018 conference brought the ZenBook Pro 14 (UX480) and ZenBook Pro 15 (UX580) that both run Windows 10 out of the box and have the ScreenPad - sits on the keyboard as a touchpad. The high-resolution, full-colour touchscreen offers a new way to let users interact with Windows apps. The screen is designed with adaptive functions along with context-sensitive tools and supports apps such as Microsoft Word, Excel, PowerPoint, and YouTube among others. This sounds more like a Touch Bar available on the high-end MacBook Pro models. 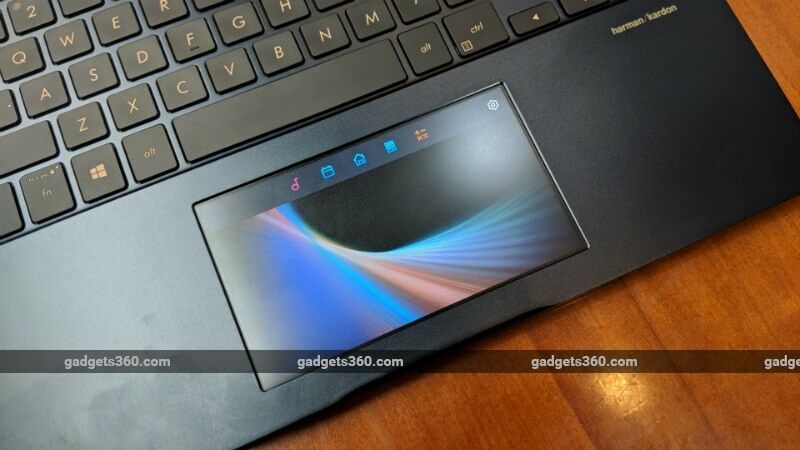 However, apart from offering interaction with Windows apps, Asus has provided dedicated programs called ScreenPad Apps that work only on the ScreenPad. It also has a secondary display mode that makes the ScreenPad acts like a small monitor. Going forward, developers will get a chance to build their proprietary apps and tools specifically for the new secondary screen. In addition to the ScreenPad, the ZenBook Pro 15 features a 15.6-inch 4K UHD NanoEdge Pantone validated display with 100 percent Adobe RGB colour gamut and is powered by up to eighth-generation Intel Core i9 processor, coupled with up to 16GB of DDR4 RAM, Nvidia GeForce GTX 1050i GPU and 1TB PCIe x4 SSD. The notebook also has gigabit-class Wi-Fi 802.11ac, Bluetooth 5.0, USB Type-C (3.1 Gen 2), and Thunderbolt 3 ports. Plus, there is a Harman Kardon-certified audio system, and the notebook includes a fingerprint sensor. The ZenBook Pro 14, on the hand, has a 14-inch FHD NanoEdge display and has an eighth-generation Intel Core i7 processor, paired with up to 16GB RAM and GeForce GTX 1050 Max-Q graphics. The notebook includes support for Intel Optane memory and has an infrared camera for facial recognition as well as built-in Amazon Alexa voice support. In terms of connectivity, there is Wi-Fi 802.11ac, Bluetooth v5.0, and USB Type-C. The ZenBook Pro 15 with ScreenPad and the ZenBook Pro 14 will launch later in 2018. Apart from the ZenBook Pro models, Asus brought the ZenBook S (UX391) with up to 4K UHD NanoEdge touchscreen comes in 13.3-inch size. The notebook has an eighth-generation Intel Core processors along with PCIe x4 SSD. It has Thunderbolt 3 connectivity and Amazon Alexa integration. Further, the notebook comes with MIL-STD-810G durability standards and comes with a 12.9mm profile. There is a spun-metal finish on top and an ErgoLift hinge design. In the new range, Asus has the VivoBook S15 (S530) and VivoBook S14 (S430). Both notebooks come as lightweight Windows 10 notebooks with five colour options, including Firmament Green, Star Grey, Silver Blue, Gun Metal, and Icicle Gold. While the VivoBook S15 has an 86 percent screen-to-body ratio, the VivoBook S14 comes with an 84 percent screen-to-body ratio. The notebooks are powered by an eighth-generation Intel Core i7 processor with Nvidia GeForce MX150 discrete graphics. Further, the VivoBook S15 has a 512GB SSD and 2TB HDD. Both have 18mm of thickness and come with an ErgoLift hinge that raises the keyboard to provide a comfortable typing experience. Moreover, the VivoBook S14 weighs 1.4 kilograms, whereas the VivoBook S15 weighs 1.8 kilograms. The next device in the new VivoBook family is the VivoBook S13 (S330) with a four-sided, 13-inch NanoEdge display and an 89 percent screen-to-body ratio. There is an eighth-generation Intel Core i7 processor, coupled with Nvidia GeForce MX 150 graphics. 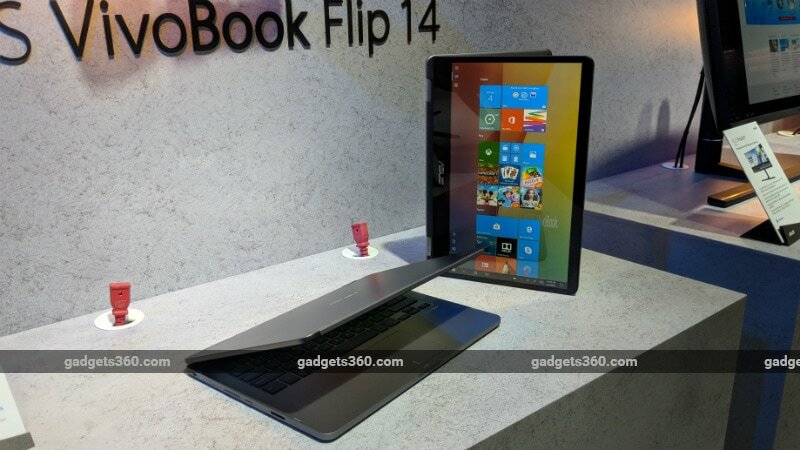 Asus has also unveiled the VivoBook Flip 14 (TP412) that features a 360-degree flippable display that offers notebook, stand, tent, and tablet modes. It is powered by an eighth-generation Intel Core i7 processor, coupled with 16GB of RAM and 1TB SSD. The notebook has a touchpad-mounted fingerprint sensor and includes Asus Pen active stylus. Besides, the VivoBook Flip 14 has a thin 17.6mm profile with a weight of 1.5 kilograms and comes with an 82 percent screen-to-body ratio. For desktop users, Asus brought the Zen AiO 27 that comes as a 27-inch 4K UHD all-in-one PC. It is powered by an eighth-generation Intel Core i7 processor, coupled with 32GB of DDR4 RAM and Nvidia GeForce GTX 1050 graphics. The PC also has built-in Asus Calibration technology that tunes colour accuracy and calibrates display brightness and colour consistency. There is also an ergonomic stand with tilt, swivel, and height adjustments. The stand also includes Qi-certified wireless charger. Giving a glimpse of the future, Asus at its Computex 2018 conference brought the Project Precog that is based on a novel dual-screen form factor and includes a 360-degree hinge design. It can work with four modes, including stand, book, tent, and flat. Moreover, the secondary display of the Precog doubles as a virtual keyboard. The device uses an Intelligent Touch feature that is touted to automatically recognise the active input device to change the virtual interface accordingly. The company claims that the device can also automatically adjust the keyboard location depending on where the user places their fingertips. Likewise, the device automatically enables the stylus model when a stylus touches the lower screen. The Project Precog comes with Windows Cortana and Amazon Alexa. Also, the dual-screen design brings primary tasks in full view on the first display, while the built-in voice assistants uses the second display to process secondary tasks. The device supports Microsoft Office 365 on the enlarged screen real estate and works with Intel Movidius Vision processing unit (VPU). 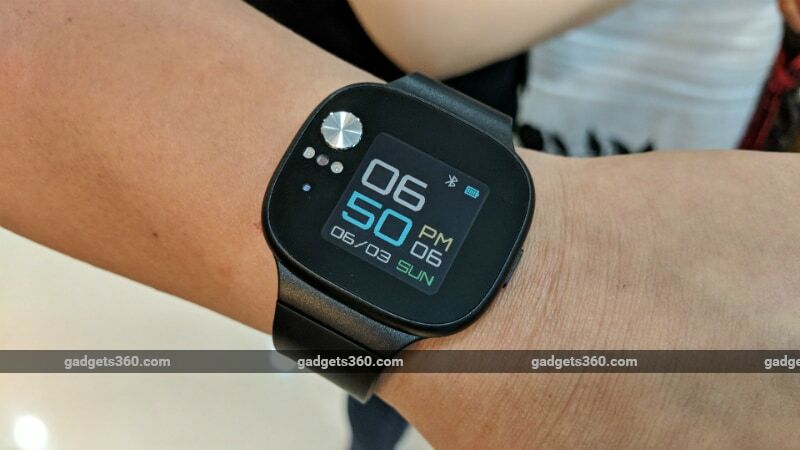 Asus unveiled the VivoWatch BP as its wearable to monitor blood pressure. The wearable has built-in ECG and PPG sensors that enable it to provide real-time blood pressure measurements in an as low time as 15 seconds. Also, there is Asus HealthAI technology to provide health stats, including heart rate, sleep quality, activity data, and de-stress index. The VivoWatch BP is touted to be 70 percent smaller and 50 percent lighter than current wrist-mounted blood pressure monitors. Lastly, there is 28-day battery life. Alongside the new computing devices, Asus at its Computex conference announced the Lyra Voice as its three-in-one 802.11ac mesh Wi-Fi router with Amazon Alexa support. The router can work as a voice assistant as well as a wireless speaker. It comes as a tri-band, AC2200-class device and has high-quality, stereo speakers. The new offering comes as an upgrade to the Lyra Trio mesh Wi-Fi system that was unveiled at CES 2018 in Las Vegas back in January. There is also the Asus RT-AX88U dual-band router based on next-generation 802.11ax wireless standard with speeds of up to 6,000Mbps. The router uses OFDMA and MU-MIMO technologies and provides four times faster throughput than the existing 802.11ac technology. There are eight Gigabit LAN ports and commercial-grade network security powered by Trend Micro. Similarly, Asus unveiled the AiMesh AX6100 Wi-Fi system that is touted be the world's first mesh Wi-Fi system with the latest 802.11ax networking and OFDMA and MU-MIMO technology. The new router also offers 802.11n and 802.11ac connectivity and works with AiProtection Pro network security. Asus unveiled the ProArt PA490 as its new Mini PC model with eighth-generation Intel Core processors, Nvidia Quadro graphics, and support for Intel Optane technology. For graphic designers, the company showcased the Asus ProArt PA34V 34-inch UWQHD monitor that comes with a curved IPS panel which is touted to deliver 100 percent of the sRGB colour gamut. The monitor is pre-calibrated to offer colour accuracy with a Delta-E colour difference of less than 2.0 and features Asus ProArt calibration technology. Further, the monitor has dual Thunderbolt 3 and supports Power Delivery (PD). It also has built-in Picture-in-Picture (PiP) and Picture-by-Picture (PbP) functionality. Besides, the company brought the Asus VG49V as a 49-inch 32:9 dual full-HD gaming monitor with a refresh rate of 144Hz and Radeon FreeSync/ Adaptive-Sync technology. The monitor has Asus Extreme Low Motion Blur technology that enables 1ms moving picture response time (MPRT). Also, there is GameFast Input to minimise input lag. The monitor includes GamePlus hotkey to enable in-game enhancements and GameVisual for optimised visuals. It also has PbP functionality to let gamers view content from multiple sources simultaneously and has TUV Rheinland Certification and Low Blue Light technologies.